(a) Press each switch and check that the red LED turns on. If one or more of the switches does not turn on the LED, confirm normal operation of the fuse and wire harness. If the fuse and wire harness are malfunctioning, replace them. 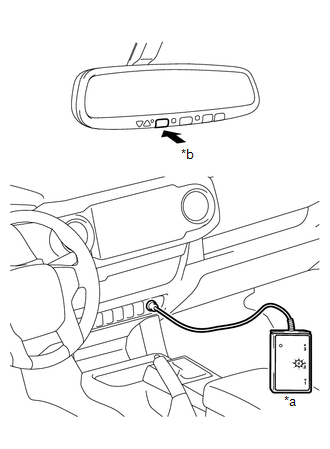 If not, replace the garage door opener (inner rear view mirror assembly) (See page ). Use the "HomeLink" tester and a tester transmitter for this test. First erase the customer's transmitter code, and then register the tester transmitter code. (a) Check if the test transmitter code was successfully registered. 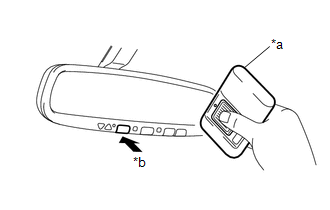 If the code cannot be registered, replace the garage door opener (inner rear view mirror assembly) (See page ). (b) Press the garage door opener switch that was registered to the tester transmitter. Check if the "HomeLink" tester's green LED illuminates. 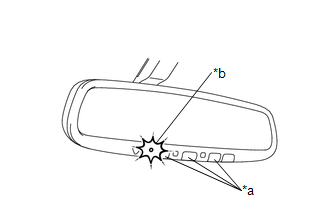 If the green LED does not illuminate, replace the garage door opener (inner rear view mirror assembly) (See page ). (c) When the inspection is complete, reregister the customer's transmitter code(s) again. Registration of codes for the customer's transmitters may not be possible in the service facility if the customer's transmitters are not available or if any of the buttons are used for rolling code-type systems. Refer to the Owner's Manual for additional information about registration (programming) of transmitter codes.